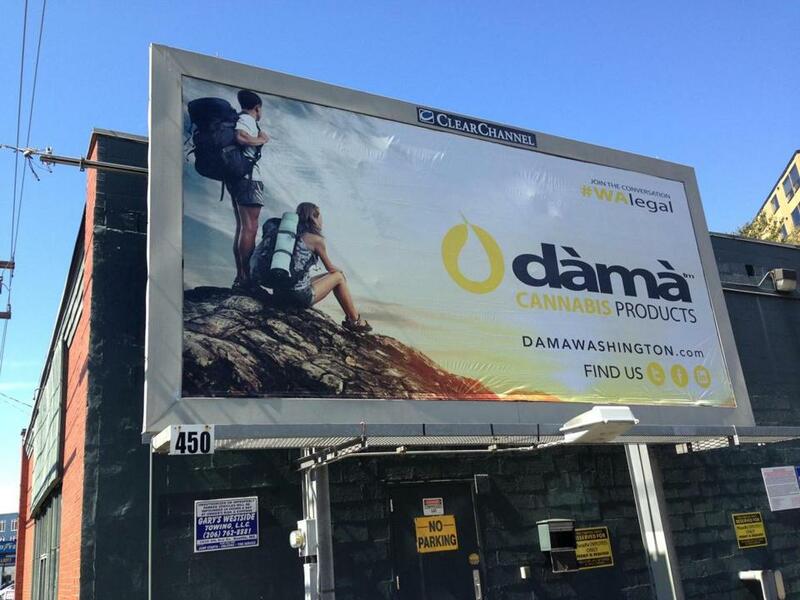 A Washington state cannabis company advertised its products on a billboard in Seattle. So should Massachusetts residents expect to see the distinctive leaf of the cannabis plant plastered on trains and billboards around Boston when recreational marijuana shops open here next year? The San Francisco transit agency’s approval of the growers’ campaign was a rare exception to the weed-wariness of nearly all major sellers of advertising space. Despite shifting public opinion and the legalization of recreational marijuana in eight states, most social media sites, online ad networks, broadcasters, and print publications enforce partial or outright bans on pot content. The main reason? Marijuana remains illegal under federal law, and advertisers do not want to risk being punished for promoting a contraband product. The MBTA is another firm “no” — it has an explicit policy prohibiting ads that promote “the sale, use, or cultivation of marijuana or marijuana-related products.” Facebook, one of the largest advertising venues on the Internet, bans content that promotes marijuana use. And ad-giant Google also rejects nearly all pot-related ads. Newspapers are also wary, thanks to a provision in federal law that makes it illegal to buy ads for a Schedule I drug such as marijuana in print publications. States that have legalized marijuana typically limit advertising by dispensaries they license, prohibiting them from buying space on billboards and running commercials in outlets where a large number of children may see them, among other restrictions. In Massachusetts, the voter-approved law legalizing recreational marijuana gives the Cannabis Control Commission leeway to impose limits on ads by dispensaries. But marijuana companies say media companies, not regulators, are being overly cautious, rejecting ads not only from dispensaries that are operating legally, but from ancillary companies that don’t even sell pot — makers of pipes and vaporizers, for example, or publications about cannabis culture. The inability to advertise to a wider audience, they argue, is holding back efforts to “professionalize” marijuana’s image and costing the industry millions of dollars in lost opportunity. Billboards have emerged as one of the few marijuana-friendly advertising venues. Weedmaps, a California company that runs a dispensary-rating website for consumers and sells inventory software to pot shops, recently bought space on dozens of Clear Channel Outdoor billboards in Massachusetts. Ads for marijuana products have also appeared on billboards in Washington state. “We’ve seen a lot of evolution by billboard companies,” Weedmaps president Chris Beals said. It’s not clear if similar billboards touting products containing marijuana will appear in Massachusetts; a Clear Channel Outdoor spokesman declined to comment. Beals cautioned Massachusetts against enacting overly stringent advertising regulations. “No one wants to see advertising targeted towards children, but forcing dispensaries to have this hidden, speakeasy-type look will only further the stigma and push people back to the illegal market,” he argued. Some ad-sellers’ policies are sowing confusion. For example, the US Postal Service in 2015 told publications that printed advertisements for pot dispensaries violate the federal Controlled Substances Act and are “non-mailable” nationwide — this despite the Postal Service having delivered pot-centric publications such as High Times for decades. But the Postal Service has also said post offices cannot actually refuse to deliver publications with pot ads. Instead, a spokesman said, workers must refer the material to “the responsible law enforcement agencies for investigation if appropriate.” The spokesman could not cite a single such case it has referred to law enforcement. Facebook is perhaps the greatest source of frustration for marijuana companies seeking broader audiences. The globe-spanning social media giant, which sold $26.9 billion in advertising in 2016, said it doesn’t allow content that “promotes the sale of marijuana” because it can’t risk disseminating content that’s legal in one area to another where it is not. Instagram, a Facebook subsidiary, has a similar policy. However, Facebook says it makes an exception for ads advocating the legalization of marijuana. And its policy is silent on advertising by equipment makers, such as vaporizers, grinders, and the like; many substitute “herb” and other pot synonyms to avoid the appearance they’re encouraging marijuana use. Another shade of gray: Facebook’s censors review and remove only content that has been flagged by users, which sometimes doesn’t happen until after the page has garnered thousands of followers. Facebook also makes a distinction between posts on a company’s own Facebook page, which are usually treated more leniently, and ads or “boosted” posts that companies have paid to put in front of more users, which seem to get more scrutiny. The result, cannabis firms complain, is an opaque, confusing system characterized by arbitrary crackdowns. A Facebook spokesman would only say the company does not “allow the promotion of the sale of illegal content,” and that it will remove ads it deems in violation. A cottage industry has sprung up to help dispensaries and other companies navigate such obstacles. One, Colorado-based Adistry, has accumulated a network of hundreds of publications and event organizers that will accept marijuana ads. The firm also helps scrub its clients’ social media pages of images or language that might trigger a Facebook review. Adistry has also figured a workaround to Facebook’s controls by paying “influencers” with large online followings to post ads on their pages. For example, Adistry recently arranged for PenSimple, which makes a grinder to process pot, to pay $2,500 to Green Rush Daily, an online publication that calls itself “the voice of the weed revolution,” to post a demonstration video on its Facebook page. The placement helped generate hundreds of thousands of dollars in pre-orders for PenSimple. PR stunts are another favorite tactic of marijuana companies. Native Roots, Colorado’s largest dispensary chain, announced last year that it wanted to buy the naming rights to the Denver Broncos’ home stadium.